When I established the Troutman Law Office, I knew exactly what kind of law office I wanted it to be. I wanted to be personal, aggressive and to act with integrity. I had worked on the other side of personal injury lawsuits — the side that defends the insurance companies — and that experience taught me a great deal. Not only did it show me how much I could do for those who had been injured in accidents, but it also helped me gain invaluable trial experience and insight into how the other side operates. As my practice developed over the years, I also had an opportunity to see what the large firm had to offer its clients. Long story short — there is no personal relationship and clients are more like numbers being pushed along so that the next case could be closed. When a client called me at the large firm, I could not remember they were even a client and I had to look them up on the computer as I spoke with them so I would know what was happening in their case. I like to personally know each of my clients so that, as we work together, they feel as though they are my one and only priority. My clients have my personal cell phone number so they can call me and text me when they have a question. Although I make it easy for clients to communicate with me, it is my goal that I keep them informed about their case so they rarely feel the need to contact me to find out what is happening in their case. This philosophy has worked well for my clients over the years, but it is only one aspect of what makes my firm unique. When I work with you, I fight to pursue the maximum compensation your case can receive. This means that I am prepared to file lawsuits, to litigate, and to present the most convincing argument possible to a jury, should your case reach that point. In other words, I won’t rush to settle for a mediocre payout, nor will I take your case up to the point of trial then pass it off to someone else. Rather, I will see your case through to the end and fight tooth and nail to get the compensation you need to cover your injury-related expenses. Many of the large heavy advertising law firms do not litigate any of their own cases, which means they are not really willing to fight for you unless it is an easy settlement. If the insurance company fails to offer a reasonable settlement offer, they refer you to another law firm and normally the attorneys fee will increase if litigation is required. This type of practice is not best for the client, because you will pay a higher fee to litigate your case and the heavy advertising firm is motivated to settle your case cheeap because they do not want to split their fee with another law firm. 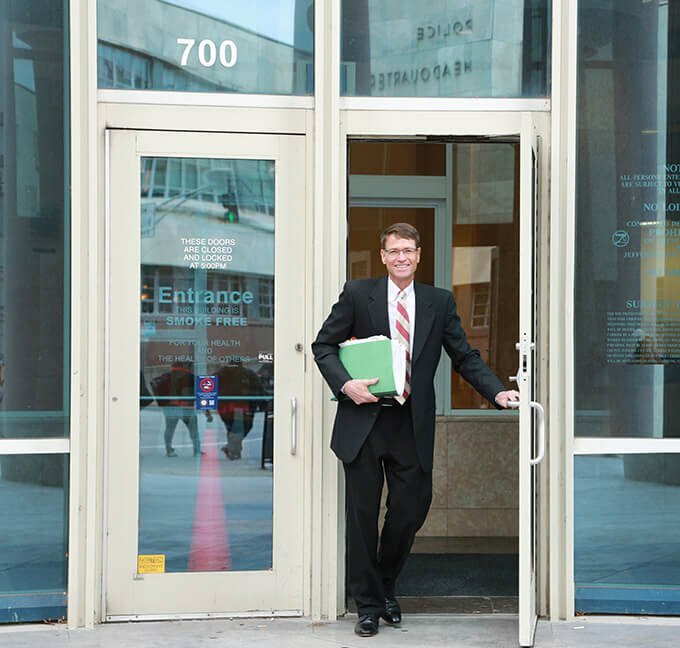 The Troutman Law Office will handle your personal injury claim from beginning to end. Clients rarely feel the need to ask about the status of their case because I work to keep them up to date. Still, I encourage you to call whenever you need me. How many auto accident lawyers do you believe respond to texts and calls after hours and on the weekends and give you their personal cell phone number? Very few, but that is what you will experience at the Troutman Law Office. My phone is always with me, so when you call, text, or email, you will almost always get an immediate answer unless I am engaged in something that cannot be interrupted. If I can not be interrupted because I am in a deposition, mediation or meeting with a client, I will get back to you as soon as possible. No leaving messages with a paralegal or secretary. Just direct communication with the attorney who is in charge of your claim. If you’re my client, I’m here for you — plain and simple. My concern is your health and well-being, so don’t ever hesitate to tell me what’s on your mind. I view my role as an advisor. I understand that this case is your case and I will advise you what I think is the best decision regarding a matter, but it is your decision. Many attorneys, inlcuding the heavy advertisers, will send a demand letter to the insurance company without ever discussing with you the amount they are demanding for settlement and some will settle the case without even asking for your approval. Those attorneys think the case belongs to them, but they are wrong. You and I will agree on the amount to demand from the insurance company and we will negotiate the claim together. Although I am not afraid to get aggressive in negotiations, I am also very committed to integrity. I will not lie, cheat, or steal to advance your case. Instead, I will present the truth in a persuasive manner. If you want to fool an insurance company or obtain a recovery for an injury that is not related to your accident or that is contrived, the Troutman Law Office is not the injury law firm for you. The truth is important to me, and unveiling the truth will always remain at the core of my firm philosophy. I will always tell you the truth about your claim. It is important that clients be told the truth about the value of their claim. Sometimes, clients have an inflated view about the value of their claim and you can count on me telling you the truth about the probable value of your claim based on 30 years of resolving cases with insurance companies and presenting cases to juries. If someone is trying to sell their house and they have it valued too high, it is likely that the house will just sit on the market until the price is reduced enough to reflect its true market value. The same is true with an injury claim from an accident. I will always tell you what my experience tells me about the value of your claim while at the same time demanding maximum value from the insurance company. Together, we will obtain the best result possible.